I have said it before and I will say it again, I love Sarah Palin. 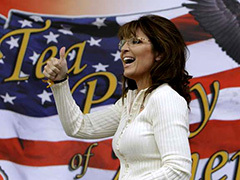 Governor Palin has come out strongly calling for the impeachment of President Obama. I say, "Way to go, sister!" During an interview, Sarah expressed the frustrations of millions of patriotic Americans, myself included. http://bit.ly/1swJnJf Enough with being intimidated and impotent to act because Obama is black. Enough with the smartest pundits in the room's explanations why it would be politically unwise to challenge Obama's unprecedented lawlessness. Enough with being politically castrated by fear of the mainstream media. Palin is calling for Obama's impeachment simply because it is the right thing to do. Palin cites 25 impeachable offenses by Obama thus far. While politicians express their shock and awe regarding Obama's daily acts of lawlessness, a tsunami of illegals is flooding our country with Obama gleefully having ordered the opening of the floodgates. Some say allowing the invasion of illegals to continue will change America forever. Remarkably, the Administration will not allow the GOP to visit the federal facilities where illegals are being held to assess the situation. http://bit.ly/1oBVdze This is astoundingly arrogant and totalitarian – the action of a supreme dictator rather than a U.S. President. We cannot allow a lawless imperial president to run rampant wreaking havoc on our great nation for two more years, in the hope his behavior will harm Democrats in elections. Reversing Obama's vote-winning entitlements and laws may be extremely challenging, if not impossible. And another thing, this Administration's secrecy, stonewall cover-ups, and iron fist tactics against any individual or institution that challenges or disagrees is outrageous and totally unacceptable. It should no longer be tolerated. It is vitally important that Americans immediately wake up and smell the tyranny and act accordingly. By the way, one of those so-called five white guys is black, Justice Clarence Thomas. Note the Democrats' trademark tactic of insidiously playing the race card in Reid's "five white guys" statement. This man is an awful evil human being, characteristic of the many hit men and women of the Obama Administration – Lois Lerner and Eric Holder to name a few. Remember, leadership emanates from the top down. Relentless in their efforts to force everyone to yield to king Obama, Reid has basically said screw the Supreme Court ruling. He will continue going after Hobby Lobby. What more evidence of an out-of-control tyrannical Administration, believing themselves invincible, does one need? Obama is king and whatever he says or desires is law. Period. A movement to impeach Obama has been underway for awhile. Governor Palin as the face of it is the perfect leader to give it legs. As an individual proud American who happens to be black, I wholeheartedly support Governor Palin's movement to impeach our imperial president, Barack Hussein Obama.